On 29 April 1995, I went to the Warner Village Cinema at the Meadowhall shopping centre in Sheffield to see Legends of the Fall. 133 minutes later, my life had been changed forever. You see, that day was the day I fell in love with film music; absolutely, head over heels in love. As a result of seeing this film, and hearing this score, I embarked on a relationship which has since played an enormous part in my life for the past decade, and will likely continue to do so for the rest of my life. I had been aware of film music prior to this day, of course; I knew about Star Wars, and Raiders of the Lost Ark, and Superman, and all the other classic John Williams scores that most children of the late 1970s know. But it was only after seeing Legends of the Fall was I ever actually aware of the effect the music was having on me in the cinema; that a creative artist was actually creating this incredible sound, making me feel these emotions. I was hooked. I wanted to know more. After the film ended, I immediately went to the HMV in Meadowhall and bought the soundtrack CD – my first – and in doing so became a film music fan. The irony is that I actually didn’t like the film very much. It’s a sprawling romantic epic, based on the novella by Jim Harrison, directed by Edward Zwick, and starring Brad Pitt, Anthony Hopkins, Aidan Quinn, Henry Thomas and Julia Ormond. It tells the story of the Ludlow family, three brothers (Tristan, Alfred and Samuel) and their father, who live in the remote wilderness of Montana in the early 1900s. Into their lives comes the beautiful Susannah Fincannon, who is betrothed to the youngest brother Samuel, but who immediately develops an attraction to the wild, passionate middle brother, Tristan, and who becomes the also object of desire for the oldest brother, Alfred. However, before long, the spectre of war looms over the Ludlow family, and the brothers head off to Europe to fight in World War I. However, it soon becomes clear that sibling rivalry and their love for Susannah will have more of an affect on their lives than the war. All this sounds quite engaging and dramatic, but I actually found the film to be something of a bad melodrama, never really engaging as one hoped it might. The Oscar-winning cinematography, by John Toll, is spectacular, but it is the music which left an indelible mark on me. Looking back, it was almost inevitable that James Horner was destined to be my favorite composer. It was only after hearing Legends of the Fall that I realized that many of my favorite films growing up – Cocoon, Willow, Krull, Star Trek II – had James Horner scores; even then, in my early teens, I knew that the music in these films was special, though I didn’t know Horner’s name or have any real understanding of where the music came from. 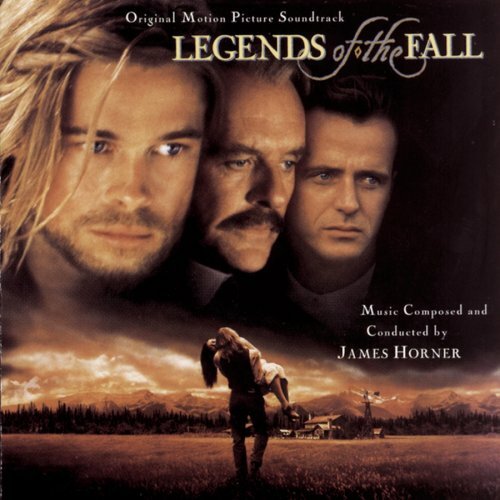 In many ways, Legends of the Fall represents the beginning of what, in my opinion, is the ‘golden period’ of Horner’s career in the mid-1990s, which would later go on to include such scores as Braveheart, Apollo 13, The Spitfire Grill, and eventually Titanic. Performed by The London Symphony Orchestra, and with featured musical soloists Jay Ungar, Kazu Matsui, Tony Hinnigan, Mike Taylor, Maggie Boyle and Dermot Crehan on various fiddles, pan pipes, and the ubiquitous shakuhachi Japanese wood flute, Legends of the Fall is a huge, sprawling, theme-filled epic, a perfect representation of the American west, of open spaces, of the beauty of nature, and of powerful all-encompassing love. Taking Wagner’s leitmotivic approach to the score, there are several themes which weave their way in and out, each reflecting a certain character or element of the story. The most prominent theme is the central theme, which appears in the opening title, “Legends of the Fall”. After an atmospheric build up, in which Matsui’s shakuhachi creates an eerie mood of spiritual reflection, the main theme kicks in: initially on solo trumpet, and then expanding to encompass the full orchestra. It’s one of those themes which envelops you from the beginning: graceful, sweeping, romantic, expansive, utterly beautiful. The main ‘secondary’ theme is called Twilight and Mist, and first appears in the second cue, “The Ludlow”, initially performed on solo piano. This theme is warmer, homelier, with a slightly folksy feeling; it actually has lyrics by Brock Walsh, and in the film is performed as a song on-screen by Henry Thomas, with his family gathered round the piano. The third theme, the theme for the brothers themselves, also gets its first appearance in “The Ludlows” immediately following the conclusion of the piano melody; this theme is musically linked to the Twilight and Mist theme, albeit with a more expansive sound, and depicts the relationship within the family: committed, dedicated, strong. As the score develops, this theme becomes less prominent, as first the war, and then the increasingly distracting presence of Susannah, begins to tear at the bonds which tie the family together. The disquieting shadow of World War I reveals its ugly head in the mysterious, moody opening to “Off to War”, which eventually expands into a series of truly majestic performances of the main theme and the ‘Brothers’ theme as the siblings abandon their comfortable life in the wilds, to serve the greater good in the trenches of France. The horrors of war come to life in the exciting, brutal pair “To the Boys” and “Samuel’s Death”, which are easily two of the most powerful and dramatic action cues of Horner’s career. The pulse-pounding percussion and noble brass flurries in these cues are simply wonderful; the hoofbeat-like drums, trilling horns and bold piano chords which accompany Tristan as he races to try to save his brother, caught in a mustard gas attack, are sensational; the anguish and confusion in the string writing as Tristan watches Samuel die in his arms is overwhelming. The serious, more austere theme for the eldest brother, Alfred, takes center stage for the one and only time in “Alfred Moves to Helena”, while the theme for Tristan, heartbreakingly tragic, appears in “Farewell/Descent into Madness” accompanied by Matsui’s evocative shakuhachi blasts, illustrating both Tristan’s affection for Native American culture, and the slight sense of wildness and fiery passion that dominates his character. This theme becomes increasingly prominent in the second half of the score, as Tristan’s fate becomes increasingly bound to that of Susannah and his father; it appears again in “The Changing Seasons/Wild Horses/Tristan’s Return”, and with searing anguish in “Isabel’s Murder”, one of the emotional high points of the score. As the score builds to its conclusion, Horner interjects a great deal of dissonance and discord into the proceedings; “Revenge” is a savage-sounding action cue filled with stark synth chords, clanging metallic percussion, haunting vocals, and brutal shakuhachi blasts. This style of writing would later crop up in Braveheart to equal effect, and although the music is clearly unpleasant and difficult to listen to, its viciousness and power is undeniable. The final cue, “Alfred, Tristan, the Colonel, the Legend…”, is quite possibly the single greatest piece of music James Horner has ever written, and that’s not something I say lightly. After a few initial moments of tension, similar in style to “Revenge”, Horner gradually opens up his orchestra, presenting each of the score’s main themes in turn, and in their most majestic setting yet. The way Horner weaves this musical tapestry together, the way each theme shares a common musical backbone and has common ground to link them together, but yet remains distinct and identifiable, shows the touch of a composer at the top of his game. Around the 10 minute mark, Horner somehow manages to make his already-sweeping themes seem even more enormous and majestic, ushering in each new statement of his themes with subtle timpani rolls and magical cymbal rings. These moments are the moments I live for, and why – despite all the accusations of self-quoting and plagiarism and whatever else has dogged his career – Horner’s music means more to me than anyone else’s. As I listen to this rapturous sound, I can feel it touch my soul. I realize that this review is very long and somewhat rambling, but it’s actually quite difficult to convey just what this score means to me on a personal level. As a direct result of James Horner writing this music I have dedicated a decade of my life to listening to, and writing about film music; I have met and befriended some of the most important people in my life; as a result of this score inspiring me to write, and to create Movie Music UK, I have been privileged to meet and interact with some of the composers whose music I admire, including (eventually) Horner himself in 2007. So, beyond the magnificence of the music itself, Legends of the Fall will always have a special place in my life. It is, and will likely always remain, my single favorite score. Music composed and conducted by James Horner. Performed by The London Symphony Orchestra. Orchestrations by Thomas Pasatieri and Don Davis. Featured musical soloists Jay Ungar, Kazu Matsui, Tony Hinnigan, Mike Taylor, Maggie Boyle and Dermot Crehan. Recorded and mixed by Shawn Murphy. Edited by Jim Henrikson and Joe E. Rand. Album produced by James Horner. I agree. Probably the most complete work that James Horner has ever done. Listened to a lot of scores, but other then Braveheart I cannot find any to match the sheer beauty and emotional power this score produces. It was astonishing that Legends Of The Fall didn’t get nominated for the Academy Award (but to be fair Braveheart and Apollo 13 were too hard to ignore and incredible works still breathtaking to this day). His ability with themes is second the only John Williams, but the last track and especially the last few moments really take you to Canada (where they filmed Legends). Amazing music and one of the best ever….